Try this invigorating winter activity with a 2-3 hour ride over groomed high alpine terrain and meadows, or a high performance ride through powder-filled back bowls. See some of the most scenic vistas on state-of-the-art snowmobiles equipped with hand warmers! Email [email protected]. Enjoy a Dinner Sleigh Ride with a hearty home-cooked chicken, steak, or seafood dinner served in a heated cabin or large tent in the woods. Or skip dinner and take the Hot Chocolate Sleigh Ride and enjoy a warm-up with a gourmet hot chocolate bar with over a dozen items available to add to your frothy hot chocolate, including Irish cream, Kahlua, Baileys, and assorted Schnapps! Email [email protected]. Enjoy the Colorado Rockies on a serene and exhilarating dog sled tour that will give you memories of a lifetime! Quickly becoming one of the fastest growing winter outdoor sports. The dog sledding business is typically open from mid-November to mid-April, snow permitting. Email [email protected]. Sit back and relax, and take in the scenery the old-fashioned way. We offer railroad rides on the Georgetown Loop Excursion, Colorado Zephyr Tour, Colorado Zephyr Road Trip Tour, and Royal Gorge Tour. Email [email protected]. The Casino shuttle allows you to sit back and relax in a luxurious limo bus and arrive in style at either Black Hawk or Central City, Colorado. Both Central City and Black Hawk are historical towns that provide limited stakes gambling since 1990. Limited stakes gambling allow patrons to bet a maximum of $100 per wager. Both towns feature slot machines, poker (live and video, black jack, craps, roulette, video keno and card room variations. Email [email protected]. A wide variety of packages are available on various pristine waters including the Blue River, Arkansas River, South Platte, Williams Fork River, Spinney Lake, Antero Lake and private waters. All trips include a knowledgeable guide, transportation and all necessary equipment. We offer a lesson, half-day tour, full-day tour, full-day float, overnight with two full-day floats, private water, and lake floats. Email [email protected]. This is a perfect adventure for the whole family. Its like sledding only a lot more fun. You are towed back up the hill while you relax, sitting in your tube. Once at the top, you enjoy a thrilling ride down the snow chutes in the big tube. 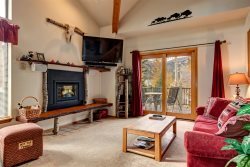 Available at Copper Mountain and Keystone Ski Resorts, as well as the Peninsula in Frisco. Email [email protected]. Indoor and outdoor ice skating is available all over Summit County. The local ice arenas hosts many groups and activities, including daily public skating sessions, public hockey sessions, youth & adult hockey leagues and learn to skate classes. Email [email protected]. Whether you're a beginner to snowshoeing and cross-country skiing or a seasoned expert, Summit County offers many miles of the funnest and most scenic trails in North America. Equipment rentals are available. Email [email protected]. Choose from mild to wild trips and everything in between! All trips come with experienced professional rafting guides, lunch for full day trips, life jackets, helmets, rafts and paddles. Wet suits, booties and splash jackets are available free of charge. Transportation is also available to and from the river. Nothing is more exhilarating than white water rafting in scenic Colorado. Email [email protected]. Feel like you're living the "Old West" while exploring the mountains upon horseback. A variety of rides and cattle drives are available for all levels and abilities. Email [email protected]. Exhilarating all terrain vehicles are a great way to see historic landmarks and panoramic mountain views. Two and three hour trips are available with a box lunch included. Email [email protected]. With mountain elevation, your golf balls fly further for your best game ever! Enjoy golfing at 5 local courses in Breckenridge, Keystone, Copper Mountain and Silverthorne. Each course is uniquely designed with beaver ponds and high alpine terrain where wildlife is frequently seen. Golf club rentals are available. Email [email protected]. The Casino shuttle allows you to sit back and relax in a luxurious limo bus and arrive in style at either Black Hawk or Central City, Colorado. Both Central City and Black Hawk are historical towns that provide limited stakes gambling since 1990. Limited stakes gambling allow patrons to bet a maximum of $100 per wager. Both towns feature slot machines, poker (live and video), black jack, craps, roulette, video keno and card room variations. Email [email protected]. Soar above the Rocky Mountains in an incredible adventure aboard a colorful hot air balloon. Email [email protected]. Don't pay full price on ski rentals, and don't waste more time in a ski rental shop than you have to. Place your order through us, and not only can we save you some cash, but your skis and equipment will be ready for you when you get to the shop. Or better yet, get your skis delivered right to your door! Email [email protected]. Don't waste your vacation at the grocery store. Simply give us a list, for a nominal fee your groceries will be ready at your accommodations when you arrive. Shopping is done at City Market which is a King Soopers/Kroger affiliate brand. Discount provided by our value card will be passed along to you, saving you money and time! Email [email protected]. Allow us to schedule your perfect spa treatment either at the comfortable spa or in the comfort of your accommodations. We offer a variety of massage treatments such as Swedish Massage, Sports/Deep Tissue Massage, Hot Stone Massage, Aromatherapy and Reflexology. We have a number of essential spa treatments available including facials, hand and foot scrubs, and paraffin treatments. Email [email protected]. We can arrange your airport transportation to and from Denver International Airport or throughout Summit County. Sit back and relax and let the experts brave the mountain driving conditions. The airport shuttle provides door to door service. Also, taxis are available upon request. Email [email protected]. Do you what a world class dining experience within the comfort of your accommodations? Have a personal chef come to you and prepare a delicious meal. Whether its an intimate dinner for 2 or a large party, our private chefs and caterers can accommodate any of your needs. Holiday parties, weddings, corporate events, birthday parties, intimate proposals, celebrity and VIP discretion, family dinners, or more. Email [email protected]. Enjoy having a holiday tree at your condominium or house rental without the hassle! We'll deliver and decorate a lovely real-looking Christmas tree for you to enjoy. The professional team will add simple decorations including lights, pine cones, ornaments, tree-topper star, and skirt. After you leave we'll pack it up and take it away. The Holiday Tree special is only $249/per tree. Email [email protected].